The MMI-01 is an easy-to-use, flexible device that allows an operator to enter move speeds, move distances or repeat loop counts. Messages can also be displayed and the program can be paused until the user presses a key, such as ENTER, YES or NO. Program branching can be accomplished based on the response of YES or NO. 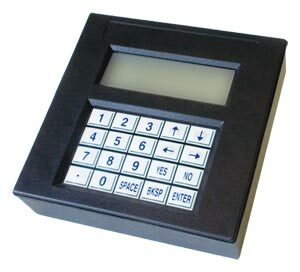 The MMI-01 is compact, easy to install and carries a NEMA 4/12 (IP56/52) rating (the 4 x 20 character display and 20-key membrane keypad are sealed). Connection to any of our "Si" or "i" indexer drives is accomplished by the standard programming cable that is supplied with every drive. This cable also supplies power to the MMI-01 so that no additional power supply or wiring is needed. Set-up and programming of the MMI-01 is fast and easy. Our programmable "Si" or "i" drives are furnished with Si Programmer software, which allows the user to easily program instructions for the terminal. Complex, confusing items like baud rate, parity and cursor positioning are handled automatically by the software. On-screen emulation of the MMI-01 by the Si Programmer software allows a potential user to try the MMI before purchasing one.